This page is written by the game's inventor, James Zuercher. Firstly, the Archbishop and Chancellor are replaced with two Panthers per side. Secondly, the initial position has the minor pieces randomly placed in a mirror-symetric setup. This results in six possible starting positions. The Rooks and Royals start as in Capablanca Chess: Kings are on f1 and f8 and the Rooks are in the corners. 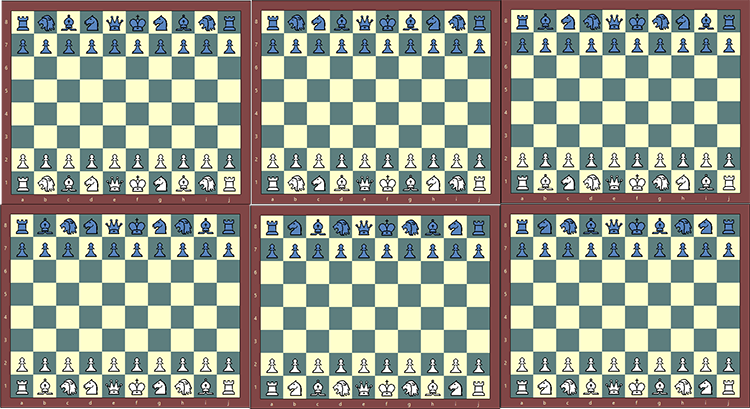 The minor pieces are between a Royal and a Rook in a randomized setup. This results in six possible starting arrangements. Graphics thru ChessV, Snipping Tool, and Photoshop. The King, Queen, Rook, Bishop, Knight, and Pawns all move as in normal chess. The new piece is called a Panther. The Panther moves as a Threeleaper (0,3) or a Wazir (0,1). The Panther can jump over friend or foe. It can capture on its landing square. The Panther is the same as Greg Strong's Scout (but does not have the initial knight move ability). Thanks to Aurelian Florea for pointing this out. I have used a Lion icon to represent the Panther. The castling, en passant, etc. rules are all as in Capablanca Chess. I have an engine for this variant that is available on prchessvariants.com. It is based on AdaChess (AdaChess.com). I have 6 .cvc files (one for each starting position) that can be used with Greg Strong's ChessV program. I'm not sure what War Machine you are referring to. The Dabbabah (meaning war machine) is a (2, 0) leaper. I think the Panther is a fine name, but this is still the same piece as the Scout. The initial move is a just a special case in that particular game. A pawn that can move two spaces initially is still a pawn. Greg's scout (in Hubbord) has the ability to move as a knight on it's first move. The Panther does not have this ability. However, I did find that the War Machine has the moves of the Panther. I did not find this when I searched before naming the Panther. Should I now look for another name? That is identical to Greg's scout :)! The Panther is a very interesting piece. It has similar characteristics like the knight. After two moves it covers a similar distance like the knight. The leaps ar (1,1), (0,2), (1,3), (0,4) and (3,3). The only difference is that the night can't go (0,6) so the operating range of the Panthter should be slightly better.